Be picked up from the bustling city of Las Vegas in early morning and head out to the wild west. The first stop will be the Hoover Dam where you will hear about the building of this massive engineering feat and have amazing photo opportunities. Continuing on the journey, travel through the beautiful high desert of Northern Arizona past an ominous extinct Volcano and caldera, the 900-year-old Joshua Tree Forest before arriving at Grand Canyon West, home of the Native Hualapai Indians. Here, you will have approximately 4-hours to explore these tribal lands and see sights such as Eagle Point (home of the Grand Canyon Skywalk) and Guano Point, and you can wander the Indian Village and see the native American dwellings from many different native tribes. You will also enjoy experiencing the Hualapai Ranch and western town. The amazing Skywalk is optional, paid directly to the Hualapai Indians (at own expense). 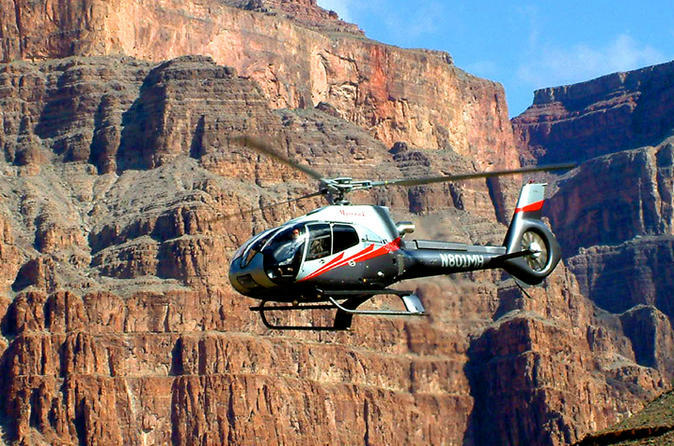 The Grand Canyon is stunning but the exciting highlight of your day will be the flight over the rim to the floor of the Grand Canyon in a state-of-the-art EC-130 helicopter, some 4,000 feet below. While on the floor of the canyon, you'll have time to explore and take photos at this amazing location, then fly another stunningly beautiful route back to the top. This, without a doubt, will be the most exciting family outing of your life. Be transported back to your Las Vegas Strip or downtown accommodations at tour's end.